Brain Drain in enterprise Dev. I have to say, I do agree with some of what he is saying. I know from my personal experience, I had spent a good 2 or so years just wallowing in the enterprise development world, not learning anything and actually losing my skills I developed before. The corporate confront zone is not conducive to eager technologists. "1 in 10 cant even pass a simple test like ‘which design pattern is used in the streams library that makes BufferedFileReader interchangeable with a FileReader?'" Without much confidence, I had guessed Decorator based on "interchangeable". I then decided that was actually some worth sneaking into future interviews, and probably a good time to revise a little. So I went scouring the internet to find all I could on the topic and I didn't actually find as much as I thought I would. Most of it came from BalusC at Stackoverflow, the rest was very scattered between blog posts, java ranch, some old pdf's and articles I had. I didn't take every single example of every single pattern I found, but rather the common ones. This may be a good way for people to learn about patterns, quite often they are using them everyday without realizing. This is used to convert the programming interface/class into that of another. This decouples an abstraction from the implementation of its abstract operations, so that the abstraction and its implementation can vary independently. Lets clients treat individual objects and compositions of objects uniformly. So in other words methods on a type accepting the same type. Attach additional responsibilities to an object dynamically and therefore it is also an alternative to subclassing. Can be seen when creating a type passes in the same type. This is actually used all over the JDK, the more you look the more you find, so the list below is definitely not complete. To provide a simplified interface to a group of components, interfaces, abstractions or subsystems. Caching to support large numbers of smaller objects efficiently. I stumbled apon this a couple months back. The Proxy pattern is used to represent with a simpler object an object that is complex or time consuming to create. To provide a contract for creating families of related or dependent objects without having to specify their concrete classes. It enables one to decouple an application from the concrete implementation of an entire framework one is using. This is also found all over the JDK and a lot of frameworks like Spring. They are simple to spot, any method that is used to create an object but still returns a interface or abstract class. Used simplify complex object creation by defining a class whose purpose is to build instances of another class. The builder pattern also allows for the implementation of a Fluent Interface. Simply a method that returns an actual type. Allows for classes whose instances can create duplicates of themselves. This can be used when creating an instance of a class is very time-consuming or complex in some way, rather than creating new instances, you can make copies of the original instance and modify it. This tries to ensure that there is only a single instance of a class. I didn't find an example but another solution would be to use an Enum as Joshua Bloch suggests in Effective Java. Allows for the decoupling between objects by passing a request from one object to the next in a chain until the request is recognized. The objects in the chain are different implementations of the same interface or abstract class. To wrap a command in an object so that it can be stored, passed into methods, and returned like any other object. This pattern generally describes defining a grammar for that language and using that grammar to interpret statements in that format. To provide a consistent way to sequentially access items in a collection that is independent of and separate from the underlying collection. Used to reduce the number of direct dependencies between classes by introducing a single object that manages message distribution. This is a snapshot of an object’s state, so that the object can return to its original state without having to reveal it's content. Date does this by actually having a long value internally. This can be used encapsulate the absence of an object by providing an alternative 'do nothing' behavior. It allows you to abstract the handling of null objects. Used to provide a way for a component to flexibly broadcast messages to interested receivers. This allows you easily change an object’s behavior at runtime based on internal state. Is intended to provide a means to define a family of algorithms, encapsulate each one as an object. These can then be flexibly passed in to change the functionality. Allows subclasses to override parts of the method without rewriting it, also allows you to control which operations subclasses are required to override. To provide a maintainable, easy way to perform actions for a family of classes. Visitor centralizes the behaviors and allows them to be modified or extended without changing the classes they operate on. In Part 1 I went through the basic syntax and requirements to get a rule developed and tested. Now to extend that, the Drools documentation is actually quite good, there is just a ton of it, so I will try to just focus on some of the main topics. Querying the contents of a can be done in 2 ways, contains and memberOf, the difference is that the collection used in conjunction with memberOf must be a variable. You can use a regex as a selection criteria as well with the key words Matches and Not Matches. You can define global variables, they should not be used as the are sometimes in code, to pass information between methods or in this case rules. They should rather be used to provide data or services that the rules use. An example would be something like an application specific logger, or perhaps constant lookup data loaded when the application starts. When the rule's consequence modifies a fact it may cause the Rule to activate again, causing recursion. Setting no-loop to true means the attempt to create the Activation for the current set of data will be ignored. Salience is a form of priority where rules with higher salience values are given higher priority when ordered in the Activation queue. possible values: "java" or "mvel"
The dialect species the language to be used for any code expressions in the LHS or the RHS code block. Currently two dialects are available, Java and MVEL. While the dialect can be specified at the package level, this attribute allows the package definition to be overridden for a rule. A rule can only activate if the current date and time is after date-effective attribute. A rule cannot activate if the current date and time is after the date-expires attribute. 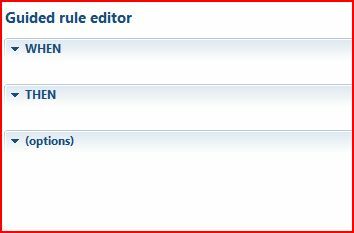 The guided rule editor seems to allow for everything you can do in code, just visually, and potentially more intuitively for those non developers. Only thing you need to do is make sure to have the objects you want to use imported in a .package in the same location as the created .brl file. In my opinion the world actually runs on spreadsheets. We all like to think that it only functions because of us and our fancy applications, but truth be told the world would miss spreadsheets more than any other single application. The business people giving us our requirements understand spread sheets, some of them better than us developers and this is the biggest single bonus on decision tables. 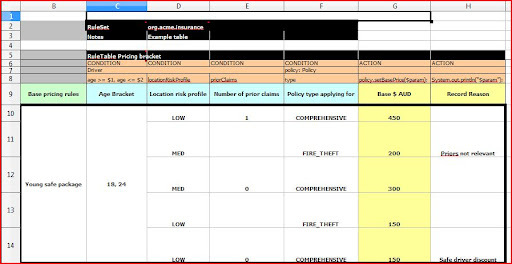 The Drools decision table at first glance did look as if it would not be as simple to hand over to business users as the Quickrules one, but it is actually split quite clearly into "code" and "data"
When creating a decision table, the eclipse plugin gives you an example, I am going to work through that. C2: Keyword ruleset, just to state that this spread sheet is a ruleset (package). D2: The ruleset (package) name. Sequential - The cell to the right of this can be true or false. If true, then salience is used to ensure that rules fire from the top down. Import - The cell to the right contains a comma separated list of classes to import. Variables - The cell immediately to the right can contain global declarations which Drools supports. This is a type, followed by a variable name. (if multiple variables are needed, comma separate them). C3/D4: Notes heading and the actual notes. C5: The RuleTable keyword and name. The "RuleTable" keyword must appear on top of the first condition column. You can have multiple rule tables on a sheet, they must just be separated by a line. C6: Marks the column as a CONDITION column, G6, does this for the ACTION. You need at least one of each for a table to be valid. If there is no data in a CONDITION column, then that condition does not apply. DURATION - This will set the duration values for the rule row. NO-LOOP - Same as in the drl, this specifies if rule is not allowed to loop. 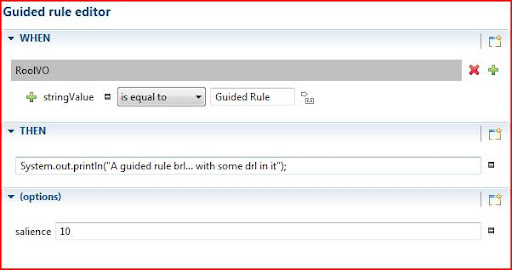 C7: This and subsequent columns in the row, define the actual variables referenced in the rule table. C8: This and subsequent columns in the row specifies where we are getting the data from. Row 9 and Column B are just labels / headings making the data simpler to understand, all the other fields and columns before there can be hidden as not to scare the "less technical". The table inside B9 is then were the specific rule data is defined, hopefully directly from the specification, by a non developer. I have uploaded this project to my Google code project, incase anyone wants it. I had a little issue with the decision table because I run OpenOffice at home and not Microsoft Office, the plugin expects Excel, so it leaves a ugly little red X in my project, but it opens fine outside the IDE and still compiles in maven. This series of posts will be about me getting to grips with JBoss Drools. The reasoning behind it is: SAP bought out my company's current rules engine and Drools is one alternative we will be looking into as soon as someone has the skills to get a proof of concept up. Being a developer this is where I will begin, the actual rules and implementation of them. Need to install the Eclipse plugin, used the update site. Unzip the binaries to a directory and withing the Eclipse plugin settings point to that directory. To understand and use the rule language, I read the Drools Documentation and the examples project. What actually took me a little to grasp, was the basic syntax and how objects were handled in the rules and I did struggle to find anything that actually explains it simply so I will give it a shot. A note on variable names.. they do not need to have the '$' but it was used in the example and without it quickly gets quite confusing. The package, and import keyword are self explanatory, what happens after the when is not. stringValue == "Learning to drool" - This is a constraint that allows us to find all RoolVO objects known to the knowledge base that have the getStringValue() value equals to "Learning to drool". If there are multiple instances of RoolVO that comply we will run this rule more than once, these are also referred to as matched objects. You can also have multiple constraints separated by a ",". $booleanVal : booleanValue - We are declaring a new local variable of type boolean called $booleanVal and gets it value from isBooleanValue. $vo : RoolVO - We are declaring a new local variable of type RoolVO called $vo. "eval( $booleanVal )" - Evaluates the boolean variable, this needs to evaluate to true for the 'then' part of the rule to be called. System.out.println( "First Rule" ); - Standard sys out. $vo.setStringValue("Done. "); - Sets the String value on the current RoolVO object that matched the constraints to Done. This is the repository of all the relevant knowledge definitions; it contains rules, processes, functions, type models. Transforms / parses a source file (.drl, .xsl) into a KnowledgePackage that a KnowledgeBase can understand. This session is used to communicate with the actual rules engine. StatefulKnowledgeSession is the most common way to interact with a rules engine. A StatefulKnowledgeSession allows the application to establish an iterative conversation with the engine, where the reasoning process may be triggered multiple times for the same set of data. I wrote a simple test for the rule I described earlier. Those in partnership with the DSL (Domain Specific Language) construct hopefully do allow for more intuitive rules creation.